The Advance Tabco DI-1-10-2X drop-in sink is made of one sheet of stainless steel that is deep drawn for strength. 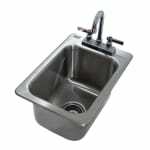 The stainless steel construction makes the sink durable and resistant to corrosion. With its rectangular shape, the sink has an increased capacity. It is sound deadened to prevent unnecessary noise. A K-52 faucet is deck mounted and plated in brass nickel for strength. The entire Advance Tabco DI-1-10-2X drop-in sink has Smart Finish™ for a mirrored appearance. The mounting clips that come with the sink can easily accommodate various mounting surface thicknesses. Large corners with a minimum dimension of 2 in.